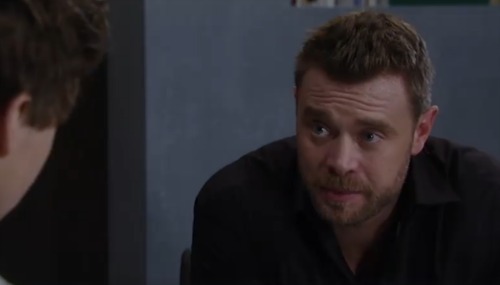 General Hospital (GH) spoilers tease that Drew (Billy Miller) will slowly put together the pieces of his past. He doesn’t see much of the puzzle at this point, but at least he has a good place to start. Kim (Tamara Braun) offered a few details and later handed over the CD Drew made for her. She suggested that maybe it would trigger something for him. Of course, GH fans can’t exactly trust Kim’s version of events. General Hospital spoilers confirm that Kim is keeping big secrets. Her demeanor is always a bit on the suspicious side, so she’s most likely fudging the facts. When Sam (Kelly Monaco) asked about her history with Drew, Kim spoke of him fondly and insisted that they knew their time together wouldn’t last long. However, Kim was perhaps a little too adamant that there was no future for them whatsoever. Once Sam was gone, Kim gazed thoughtfully at Oscar’s (Garren Stitt) picture before taking the CD to Drew. It seemed like she had a change of heart. General Hospital spoilers tease that Kim might be warming up to the idea of Drew remembering. She may not want to complicate his life, but the heart wants what it wants. By handing over music that meant something to Drew, Kim may think it could bring back old feelings for him. She probably wouldn’t be opposed to that. Kim has slowly been offering more info, but there are undoubtedly some things she’s leaving out. Drew and Kim’s romance was supposedly quite intense. If they fell so fast and hard, it would’ve been tough to just cut it off after three months. Was Drew really willing to walk out of Kim’s life and never look back? They might’ve made a choice about their future after all. It’s possible that Kim’s deceiving Drew about the nature of their relationship. What if they got married before Drew was deployed? A quickie wedding is common in that type of situation. General Hospital spoilers indicate that Kim has pretty much been on her own with Oscar since she knew Drew. Maybe part of her felt she should honor their potential vows. Kim might’ve held out hope for her husband’s return. She may be hesitant to reveal the marriage to Drew, but she wouldn’t mind if he remembered on his own. Sam will eventually find out something that makes her question her decision to marry Drew. If he’s already married, that would certainly do it! General Hospital spoilers hint that the drama’s about to heat up, so stay tuned. We’ll give you updates as other GH news comes in. Stick with the ABC soap and don’t forget to check CDL often for the latest General Hospital spoilers, updates and news. Do You Think Drew & Kim Were Married In The Past?